To pull off the best possible results, novice powder coating businesses need access to state-of-the-art curing ovens. All things considered, this is the biggest investment a new company can make. 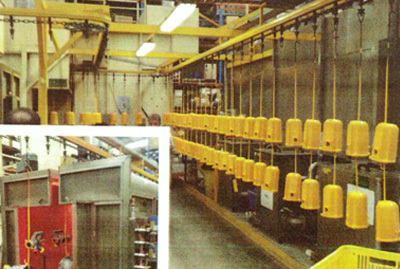 Quality control issues on powder coating production lines have been known to cause long periods of equipment downtime. An appearance issue, according to the quality control report, has spread through a new batch of workpieces, and the management guys are worried the blemishes indicate a deeper problem. What's their next move? Assuming the workpiece is untainted, the cause of the appearance issue seems equipment related. Undeniably tough and long-lasting, there are few outside barrages that can impact a powder coated surface. Time, however, is one such assailant, one that can't be avoided. Imagine this scenario: a seaside resort has several attractive powder coated products on display. Salt is accumulating on the objects, and they're starting to show signs of wear. Are There Additives Used for Powder Coating? Powder coating additives enhance the final shell-like coating with different features and properties. There are even liquid additives, which would seem counterintuitive to what's essentially a dry process. Whatever their form, though, they control the curing finish, both in appearance and impenetrability, in several important ways. Starting with flow control additives, here's a guide to this clearly important subsector of the industry. Like a bad case of skin rash, the powder coating is peeling off a workpiece. The exposed material underneath is going to corrode if the cause of the application defect isn't determined. Bringing the line to a halt, the equipment is on pause. The clock is ticking. What's making the normally unbreakable membrane crack? What's the root cause of the bubbling and peeling effect? As a whole-system process, powder coating technology consistently produces chip and scratch resistant finishes, which are also extraordinarily attractive. Imagine that eminently serviceable configuration on a node-to-node scale. Tightening a critical eye on a single piece of equipment, it's clear that those results are heavily influenced by equipment manufacturers, who use cutting-edge engineering design mastery to maintain a high level of end-quality finesse. Batch processed or sourced from a handful of custom-made components, powder coating technology continues to strengthen all kinds of items. The parts exude visual appeal. And, to the touch, they're impervious to damage. When their features are stripped away, all that's left is a box that cures powder coated parts. But what if someone has an about-face, a desire to view the trimmings and extra features? In all honesty, there's more to a state-of-the-art curing oven than an aptitude for powder fluidizing and setting. For instance, this block of curing tech is loaded with advanced thermal management features, which invariably ensure consistent results. Stainless steel is a remarkably versatile alloy. It's mechanically strong, obviously, and unaffected by oxidizing agents. Used in kitchens and catering establishments, stainless steel doesn't allow bacterial growths any purchase. Finally, it's an easy to clean metal. On transferring those benefits to powder coating booths, the industry gains a whole lot of material benefits. Just for a minute, turn away from the spray booth. Relocate to the room where the workpieces are being prepped. Just by looking at the pretreatment equipment in here, you can tell this is an essential part of the operation. To cut a long story short, if a Melbourne-based powder coating shop ever hopes to produce high-quality powder coated parts, it needs a first-rate equipment setup. 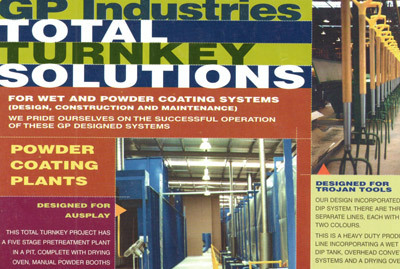 A turnkey powder coating system has found its place on a factory floor. There are plastic curtains separating the pre-processing room. 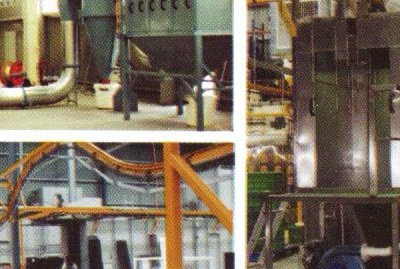 In the main processing area, a specially vented booth is engaged in a coating operation. From booth to curing oven, the train of moving workpieces glides forward, all thanks to an overhead conveyor system. Watching this clockwork-precise process, a momentarily unoccupied team member ponders safety issues. The process of aluminium extrusion is one that has found itself a home within many industries in the world. From the automotive industry to the International Space Station, and everything in between, employing the process of aluminium extrusion has been found to be not just ideal, but essential. The process of aluminium extrusion is one that clings to all of the scientific and technical progress that has been made within the engineering field. Electrostatic spray guns rely on a delicate balance. Pressure variables and particulate flow rates dominate that relationship. Check out the tubes entering the handle. There's a powder feed line there, plus an electrical cable. An air compressor hose is in the mix, too. As the gun is triggered, pressurized air fires the balanced powder load towards a grounded workpiece. Measured in terms of uniform transfer efficiency, the system is in a state of equilibrium. What is Batch System in Powder Coating? Production lines are complicated beasts. In an ideal world, a line of products zips through the factory, one at a time, before arriving at the finishing room. But this isn't an ideal world, and that approach, well, it can be slow. What if the shop, a powder coating shop, uses a batch processing system instead of this linear mode of operation? Let's check out that group or stack treatment method. Troubleshooting guides are tough to master. The operator follows repair procedures, or maybe the entire team adopts a trial-and-error approach. Either way, the process is usually gruelling. For that reason, we're going to make it a little easier to follow. Let's test out that straightforward approach path on this powder coating problem. The equipment is breaking down, the repairs are costing the company a fortune, and we need solutions. If you've got a fabrication job where longevity and durability are paramount, you likely will want to have the right finish for your product. Whether you are creating kitchen equipment or HVAC gear, or likely something in between, quality and durability are going to be aspects you focus on. This leads us to look at powder coating vs wet paint as a finish for your product. Heat Tolerance of Powder Coating: How Much Can It Take? Powder coating work relies on procedural mastery. One stage leads inexorably to the next, so start with the prep work. Cleaned and prepped, the electrostatic coating phase is initiated, then the workpiece enters the curing oven. On top of those systematically regulated operations, there are critical processing tolerances to address. Do you see an example of tight-gap process control? We can, right there in the curing oven.